Jack Joseph Valenti (September 5, 1921 – April 26, 2007) was an American business person. 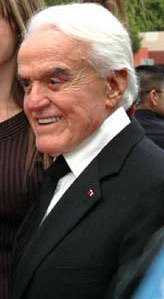 He was president of the Motion Picture Association of America from 1966 to 2004. During that time, he created the MPAA movie rating system. Valenti died in Beverly Hills, California from a stroke, aged 85. ↑ Halbfinger, David M. (April 26, 2007). "Jack Valenti, Confidant of Presidents and Stars, Dies at 85". New York Times. Retrieved 2008-07-09.